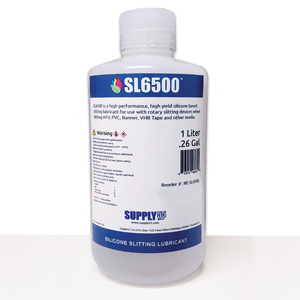 SL6500 is a silicone lubricant engineered for use with roll slitters when slitting application tape, VHB tape, heat transfer vinyl, pressure sensitive vinyl, self adhesive vinyl, reflective films and other hard to slit material. Extended Blade Life – SL6500 extends blade life by aiding media release and reducing friction during slitting. Reduces Adhesive Build-up – SL6500 reduces adhesive build up on the slitting blade resulting in cleaner edges and cleaner slits. Improved Performance – SL6500 improves overall slitter performance when slitting difficult materials. High Yield – Increased usage yield compared to aerosol spray cans. Overspray – No overspray on the equipment or work area from propellant drifting. Application – SL6500 is applied with a microfiber cloth, directly sprayed onto the rotary slitting blade or dispensed by an onboard lubrication system. Non-Aerosol – No environmentally damaging propellants and is easily applied using a handheld sprayer. Packaging – SL6500 is available in one (1) liter bottles. Take control of your workflow today with SL6500 from Supply55. SL6500 is available exclusively through Supply55, Inc. Additional information is available on the Supply55 website at www.supply55.com or by calling Supply55 at 734-668-0755. About Supply55, Inc. www.supply55.com – Based in Ann Arbor, Michigan, Supply55, Inc. was founded to provide unique value added products to the sign, screen and graphic arts trade. All Supply55 products are selected, evaluated and brought to market with the simple goal of reducing end-user operating costs while improving the workflow and quality of the end-users finished product. Other company names and products mentioned may be trademarks of their respective owners.